A stunning archtop whose sound matches its super size! Condition: Used, Good - Ample finish checking on top, playwear and scratching overall. The top was refinished at some point. Pure tonal indulgence that's captivated the world since its original release early on in Gibson's history. No surprise there! There's nothing like playing one of these--imagine making a hairpin turn in a semi! Improbable power and presence paired with improbable playability and responsiveness, through and through. 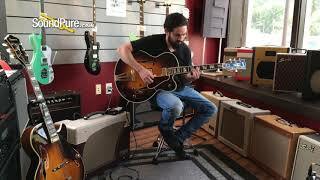 In this video, Sound Pure electric guitar specialist Michael Buckley plays a Gibson Custom Super 400 Sunburst Archtop through a Carr Impala Amplifier. There are few guitars as important to the history and development of Gibson as a major manufacturer of six-stringed instruments as the Super 400 and Super 400-CES. The model first appeared in 1934 as an archtop acoustic with no cutaway simply named the Super 400. As it was then – and still remains today in the Super 400-CES – the Super 400 was the largest guitar the company had ever produced, with an astounding body width of 18 inches. But as Gibson has evolved over the years to adapt to the industry’s ever-changing advancements, so have its Super 400s. The earliest Super 400 models were quite similar to Gibson’s other archtop acoustic, the L-5, and featured a hand-engraved tailpiece and hand-engraved finger rest support, along with an “L-5 Super” truss rod cover. In 1939, the guitar underwent several changes that still remain with it today, including an enlarged upper bout, a new tailpiece similar to the one on the L-5, enlarged f-holes and a Venetian cutaway option that is now a standard feature. Although the Super 400s were discontinued during the mid-1940s because of the supply shortages of WWII, Gibson reintroduced the model in 1949. And as Gibson strived to gain an upper hand in the electric guitar market in the early 1950s, the model continued to progress with the eventual introduction of the first electric version.